Some might assert that autonomous personal vehicles are being developed to improve safety, reduce fuel consumption, decrease urban infrastructure strains, and so on. But let’s be honest: One of the key economic “drives” for this technology, no pun intended, is related to the prospect that people will have new time windows in their days in which to consume visual media. However, due to some fundamental aspects of human physiology, this lucrative ambition may prove to be more difficult to implement than imagined. Recent studies at the University of Michigan Transport Research Institute and elsewhere have set out to discover what people might be drawn to do inside their cars if they find themselves relieved of the task of driving. In one study, researchers queried thousands of adults on multiple continents, and one of the key findings – one that should come as no surprise to anyone who’s ever attempted to read a book inside a moving car – is that autonomous vehicle occupants who are presented with interesting (non-driving-related) visual content are, well, quite prone to experiencing motion sickness. One study estimates that between 4 and 17 percent of adults – depending on region – could experience ‘moderate or severe motion sickness at some time’ inside an autonomous vehicle. Another study suggests that as many as 66 percent of adults could experience mild to moderate motion sickness. That’s a big swing in numbers, so it appears that the verdict is still out. But if we accept the concept that there’s some validity to all this, we might logically ask: What are the root causes of motion sickness in autonomous cars, and is there anything that can be done about it? In a traditional human-piloted car, it is known that feelings of nausea, discomfort, or “motion sickness” are more often felt by passengers rather than by drivers. One explanation for this is that passengers are not able to anticipate the directional changes commanded by the driver, thus leading to sensory confusion. Another explanation is that near-field visual tasks not related to driving (reading, hand-held device interaction, and so on) can be disturbing in moving vehicles due to visual-vestibular conflicts. So, if we accept that everyone could be a passenger and that everyone could be engaged in interesting visual tasks inside an autonomous car, we are faced with at least two factors that may unavoidably lead to human discomfort in any autonomous car scenario – and this is even after the (numerous) engineering hurdles related to autonomous car design have been successfully overcome. Needless to say, this presents quite the challenge for vehicle manufacturers and technology providers. Certainly, there are known ways to mitigate motion sickness in cars from an engineering/design perspective, some more practical than others. Autonomous vehicle designs could, for example, embrace larger visual fields via larger windows; semi-transparent, forward-facing video and work displays; and seats that offer larger recline angles while comfortably limiting head motions. But fundamentally, vehicle manufacturers are tasked with finding ways to mitigate occupant discomfort “risk factors” without detracting from the traditionally appealing aspects of the in-car experience. Before this can be done, however, there needs to be a way to more rigorously explore the onset of car sickness in the context of the traditional vehicle development process. And this, to put it bluntly, means making people feel sick on demand in order to learn how to prevent it from occurring in the first place. Fortunately, there’s already a well-proven way of doing this. For nearly a half century, driving simulators have been used as vehicle development tools, primarily in the area of automotive human factors research. Over the years, simulator users have widely reported problems with dizziness, nausea, and disorientation. It even has a name: Simulator Adaptation Syndrome (SAS). The causes of SAS are essentially the same as those of car sickness in real cars: sensory stimulation conflicts. The prevalence of motion sickness in driving simulators (and aircraft simulators as well) means that the historically, [simulator] engineering efforts have been directed towards eliminating it. After all, it is quite difficult to conduct meaningful lab experiments of any duration if the participants are experiencing discomfort due to the simulator itself. Some classes of driving simulators that have emerged in recent years, particularly those purposed towards vehicle dynamics engineering (rather than human factors research) have been quite successful in eliminating SAS. Ironically, as noted in recent articles, now that certain classes of driving simulators have been refined to this level, the tables can be turned in a very interesting way. The same advanced driving simulator technologies that have been developed in order to eliminate SAS, can now be purposefully relaxed and/or inverted in order to intentionally induce motion sickness and discomfort in simulator experiments. Because this counter-intuitive approach can be used to replicate and study the circumstances that trigger motion sickness in real vehicles, it is becoming a key part of autonomous vehicle research and development. 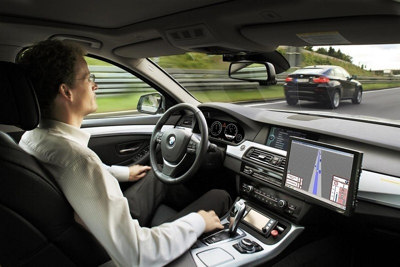 As with other types of simulation-driven experimentation, the beauty of using a driving simulator for these studies is that vehicle engineers have almost infinitely variable, but completely repeatable control over the entire vehicle and driving environment. Hands-on testing with real people can begin much earlier and more often in the vehicle development process, saving time and money. Plus, perhaps most importantly, it’s safe. Hats come off to the drivers who are participating in this on-going research (which is designed to be uncomfortable!) in order to improve the cars of tomorrow. If driving simulators as vehicle development tools can help improve overall understanding of motion sickness onset and actually contribute to reduced occurrences of motion sickness in autonomous cars, it brings us to an interesting question: How might you choose to spend your time in a car that can drive itself? To review some of Ansible Motion's unique capabilities in the area of engineering-class Driver-in-the-Loop (DIL) simulation, and learn how working with us can benefit advanced vehicle developments, download our FREE white paper, “10 Advantages of Ansible Motion DIL Simulators”.